Flyers rookie goaltender Carter Hart is an unabashed fan of Montreal Canadiens goaltender Carey Price, and has been for years. On Saturday night, Hart will return to Montreal for the first time since the gold medal game of the 2017 World Junior Championships and play against the Canadiens for the first time at the NHL level. Come Saturday night, Hart and the Flyers travel to Montreal to take on the Canadiens. It remains to be seen whether Price or Habs backup Antti Niemi will get the start in goal for the Habs. Niemi himself was a former Vezina Trophy finalist during his days with the San Jose Sharks. “Pricey is one of my favorite goalies. He’s a guy I that I really looked up to growing up. I’ve never gotten the chance to meet him. To see him face-to-face on the ice will be pretty cool,” Hart said after the Flyers practice on Friday. At this early stage of his professional career, every experience for Hart — both on the ice and in terms of off-ice life — is still new and exciting. He is no starry-eyed kid, though. Hart wants to be judged solely on his own merits, both at present and in the future, and not against others’ career paths. He does not pay attention to the hype of becoming “the next Carey Price” or the “next” version of any other established NHL star goaltender. That said, every competitive athlete gets psyched to test himself against the elites. Hart has already had the experience of competing against reigning Vezina Trophy winner Rinne and former Vezina finalist Devan Dubnyk. Now he will face either Price or Rinne in Montreal; one of the NHL’s true mecca venues. “Montreal is a great city and a great hockey city. They are very passionate about the game and about their team. It’s going be fun to go there,” Hart said. Hart has heard the comparisons to Price before. The are relatively few goalies age 20 or younger who have gotten the chance to play in the NHL at such a tender age, and Hart is the youngest goaltender currently in the NHL. Price, like Hart years later, was a standout in the Western Hockey League and for Team Canada at the World Junior Championships before turning pro. Mature beyond his 20 years, Hart does not get caught up in the hype or outward pressure. He goes about his daily routine of preparing to play, assessing his game afterward and then moving onward whether he won or lost. There is a stratospheric difference between showing early NHL career promise and doing what Price did in 2014-15 when he won not only the Vezina Trophy as the league’s top goaltender but also the Hart Trophy and Ted Lindsay Award as the media-selected and NHL player-chosen most valuable player in the league. Apart from his considerable talent, part of what makes Hart such an exciting young goaltender, however, is his ability to compartmentalize the game and stay focused through whatever accolades or bumps in the road come his way. “Definitely, it’s been impressive what’s he’s been going. There’s the on-ice part of it and the off-ice. And it hasn’t been easy. There are adjustments any player, but especially one Carter’s age have to make,” said Scott Gordon, the Flyers interim head coach. Hart had an uneven start to his rookie season with the Lehigh Valley Phantoms, including getting pulled in two games, before a run of strong starts prior to his NHL call-up. He has done well so far for the Flyers but was also pulled from a game and twice successfully played through the in-game adversity of his team spotting opposing clubs 2-0 leads with little margin for error thereafter. It’s all part of the learning curve and proving one’s mettle as a young player. No one is immune to it, including goalies such as Price who went on to achieve stardom in the world’s top league. Price was hyped to almost absurd levels in his NHL rookie season following his junior career success and winning the Jack Butterfield Trophy as American Hockey League playoff MVP during the Hamilton Bulldogs run to the Calder Cup championship in the spring of 2007. Price followed that up with a strong NHL rookie regular season in 2007-08. Then Price hit some snags. He had a rough series against the Flyers in the second round of the 2008 Stanley Cup playoffs as the favored Canadiens bowed out in five games. His next season was uneven, and there were already some impatience among segments of the Montreal media and fanbase, with some calling for Jaroslav Halak (now with the Boston Bruins) to receive additional playing time. Price, of course, soon began to blossom into the caliber of NHL goaltender he was hyped to be before ever playing a minute in the league. However, he dealt with an injury-shortened 2015-16 campaign and struggled at times in 2017-18. Moreover, any time a goalie plays in the hockey-obsessed Montreal market — where runs of multiple Stanley Cup championships were once considered a birthright but has neither won the Cup nor reached the Finals in the last 25 years — the pressure is very high. Inevitably, goaltenders shoulder too much individual blame or credit despite hockey being the ultimate team game. Hart has his own set of outward pressures on him. To put it mildly, the Philadelphia fanbase is eager to for the team to find a No. 1 goaltender of the present, near-term and long-term future alike. That is an unfair burden to put on Hart’s shoulders at his age. He has been handling that pressure by simply embodying the wisdom behind the one-day-at-a-time cliche that players and teams have professed for many years. 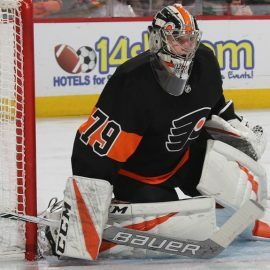 Most of all, the Flyers rookie aware that Saturday’s game is not Carter Hart vs. Carey Price or Antti Niemi. It is Flyers vs. Canadiens. Win or lose, he will exit the upcoming bye week and NHL All-Star break with but one objective in mind: getting ready to play in his next game thereafter.